FMC Connectors: Samtec FMC connectors are Application Specific Product (ASP) versions of Samtec's SEARAY™ High-Speed Array system. These FMC connectors are available direct from Samtec and are scalable to high-performance applications as your hardware development effort demands. They are a 400 I/O high-speed array with 160 user-defined, single-ended signals (or 80 user-defined, differential pairs), 10 serial transceiver pairs and additional clocks. ExaMAX® Backplane Connectors: The Xilinx VCU110 Development board and Backplane loopback card, used together, demonstrate 28 Gbps performance over Samtec's ExaMAX® Backplane connector system. 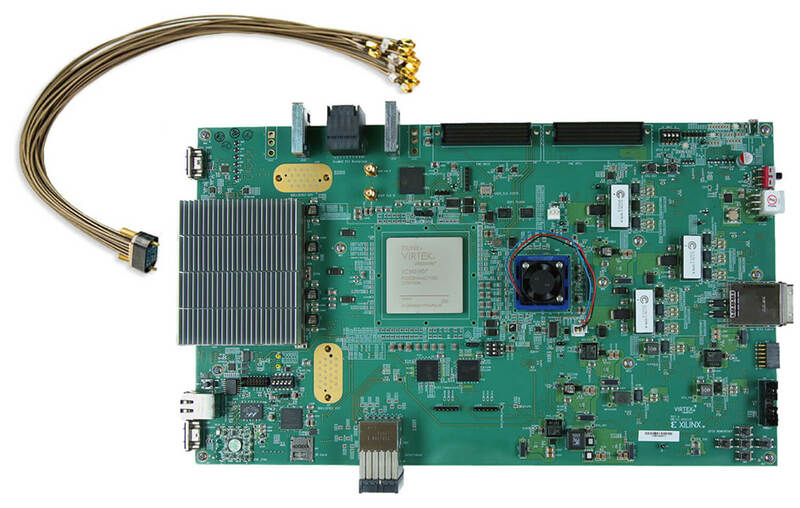 The backplane loopback card assists Xilinx customers in verifying the external backplane loopback of 8 GTY transceiver I/O channels out of and into the Xilinx Virtex UltraScale XCVU190-2FLGC2104EES9854 FPGA through the Samtec ExaMAX® connectorized channels. Also included are 20 looped back Interlaken channels. ExaMAX® equipped channels meet the IEEE 802.3bj mandated loss performance of 25 db.